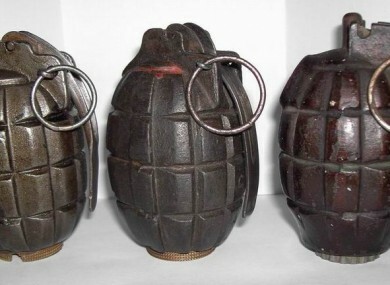 THE ARMY BOMB Disposal team has rendered safe a Mills-Type grenade dating from the early 20th century which was washed ashore following recent storms in Ballyshannon, County Donegal this morning. The team were deployed to The Mall Quay at the request of local gardaí. Arriving at the incident at 9.55am, they examined the grenade and then transported it to a safe location. Following this it was subsequently made safe by means of a controlled explosion. The scene was declared safe at 10.20am and the team returned to base. The Defence Forces maintains Army Bomb Disposal Teams throughout the State on a 24 hour basis to respond to requests for assistance. This is the seventeenth call-out so far in 2014. Email “Stormy weather washes ashore early 20th century grenade in Donegal”. Feedback on “Stormy weather washes ashore early 20th century grenade in Donegal”.